Cuisinart 77-10 Chef's Classic Stainless Steel 10-Piece Cookware Set is on sale right now at Amazon for just $149 (reg. $400). 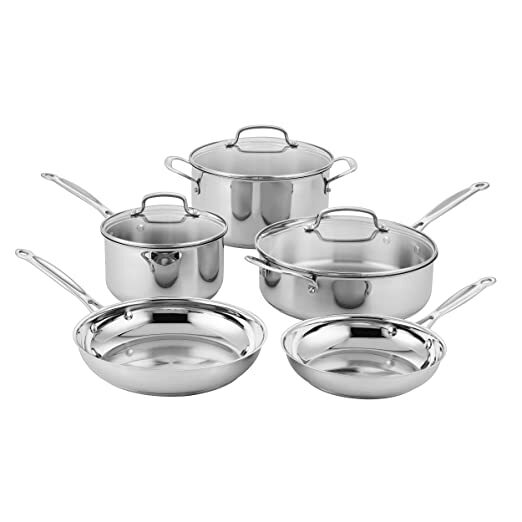 Compared to other major cookware brands such as All Clad, Emeril, Wolfgang Puck, Jamie Oliver, Williams Sonoma, Macy's, Linen n Things, this Cuisinart's chefs classic set is of high quality, and its features and value could not be matched. The price with free shipping, also included a kitchen tools set, a nice bonus. 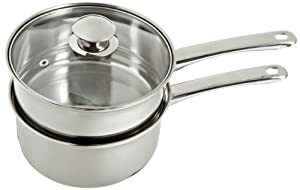 Cuisinart MultiClad Pro Stainless Steel Saucepan with Cover 美膳雅的不锈钢单柄汤锅。 2-quart saucepan made of 18/10 stainless steel with solid aluminum core。 厚底但是加热快，加热均匀。 原价85刀， 现在打折$38.58 with free shipping. 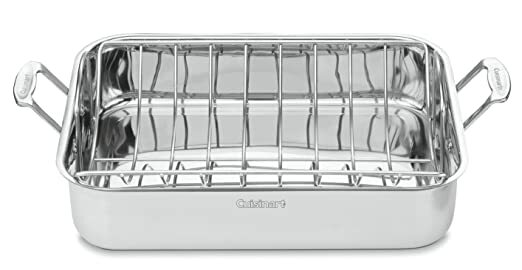 Cuisinart 77-412 Chef's Classic Stainless 4-Piece 12-Quart Pasta/Steamer Set 这套是不锈钢带蒸屉的4件套锅。 review非常的好， 原价150刀一套， 现在只要 $52.99 with free shipping. 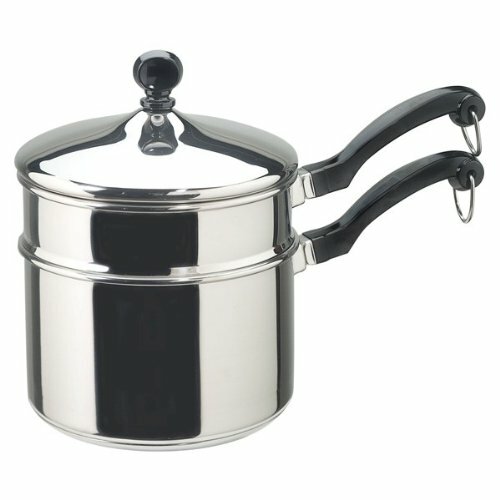 This set includes a 12-quart stockpot, pasta insert, steamer basket and a lid. 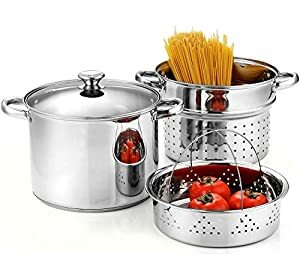 Amazon 现在 this highly rated Cook N Home Stainless Steel 4-Piece Pasta Cooker Set 降价后 for only $29.99 (regularly $39.99). 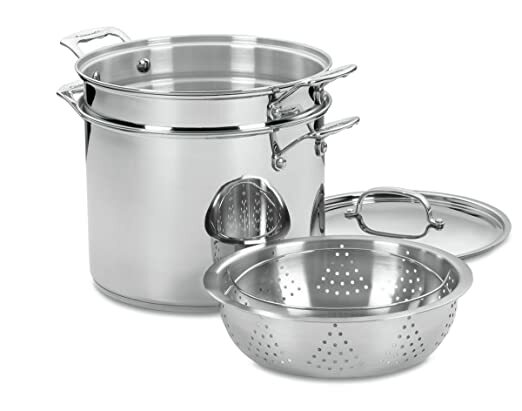 This 4-Piece Set includes one 8-qt stock pot with a tempered glass lid, steamer insert and pasta insert – all in mirrored polished stainless steel. 每年年底的时候，也是套锅打折的最佳时间。 Amazon.com 现在 has dropped the price on this 10件套的不锈钢套锅 10-Piece Cuisinart Chef’s Classic Stainless Cookware Set down to just $79.50 shipped (regularly $112) – BEST PRICE! For a limited time, Macy’s.com you can get this Bella 12-Piece Stainless Steel Cookware Set on sale for $34.99 (regularly $119.99). Even better, submit for this $15 mail-in-rebate (expires 7/25) making this Stainless Steel Cookware Set just $19.99! TODAY ONLY, Amazon now get this Cuisinart 8 Piece MultiClad Pro Set for just $139.99 shipped – regularly $299.99! This set includes a 2.5 Quart Saucepan with Lid, a 4 Quart Saute Pan with Helper and Cover, a 6 Quart Stock Pot with Cover, an 8″ Skillet and a 10″ Skillet. This set features a Triple-Ply construction that includes the unsurpassed heat conductivity of a pure aluminum core so you get maximum heat retention and even heat distribution, eliminating hot spots. 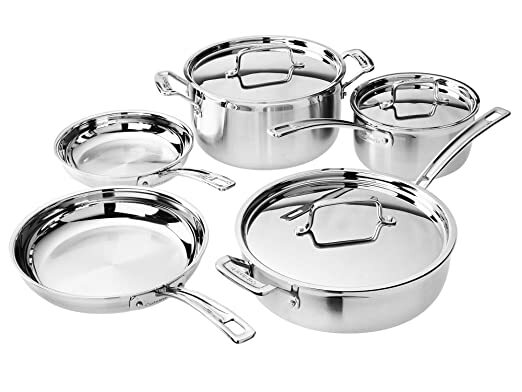 Today, November 15th only, Macy’s.com is offering up this Cuisinart Multiclad Tri-Ply Stainless Steel 12-Piece Cookware Set for $249.99 shipped (regularly $375). Even better, when you add this set to your cart, you will save an additional 20% which drops the price down to $199.99 shipped. Plus, when you purchase this cookware set, you will receive a FREE Cuisinart 3-Piece Nonstick Bakeware Set ($85 value) – automatically added to your cart. That means you can get the above mentioned cookware set and this bakeware set for $199.99 shipped! 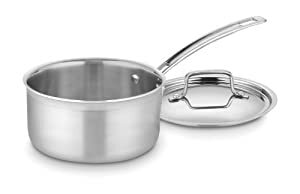 Macys.com has 13-Piece Tools of the Trade Stainless Steel Cookware Set on sale $34.99 - $10 Rebate = $24.99. Shipping is free. On Macys.com where they dropped the price on this Cuisinart Onyx Black & Rose Gold 12-Piece Stainless Steel Cookware Set down to just $199.99 shipped (regularly $299.99). Use promo code RED (25% off), Shipping is free. Pay $149.99, Submit the $25 Macy’s Gift Card mail-in rebate. Final cost $124.99 shipped! 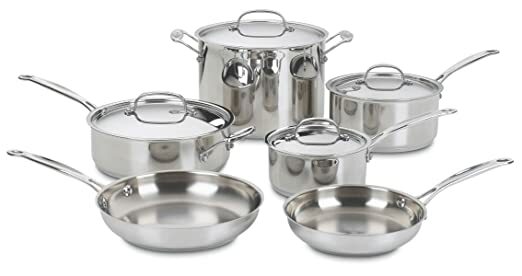 Today, February 27th only, on Amazon.com where you can buy this Cuisinart Classic Stainless Steel 8-Piece Cookware Set for only $99.99 shipped (regularly $365). 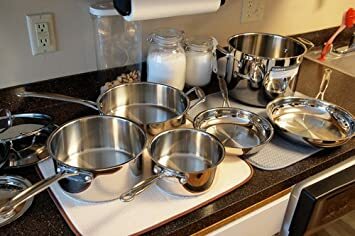 This set includes a 2.5-Quart Saucepan with Cover, 4-Quart Sauce Pan with Helper and Cover, 6-Quart Stock Pot with Cover, 8″ Skillet, and a 10″ Skillet. The solid stainless steel riveted handles stay cool on the stovetop, and the glass covers are made from break-resistant glass.